Welcome to the first quarter of the new year! Hopefully 2018 is off to a great start for you. For many businesses this is where they ramp up and see a lot of their profits. I know of quite a few businesses that use the profits from the first quarter to cover their operating expenses for the year. This may explain why we are seeing so many tools drop updates. Whatever the case may be for you, I hope your year is starting off better than you anticipated. If you were to ask me about the best tool investment I made last year ThriveCart is definitely in the top three. I feel like every other report I mention some new update. The last update for payment options is still one of my favorites. If you’re not part of the ThriveCart Academy Facebook group you will more than likely miss these updates. I happened to be scrolling through my Facebook feed and caught the latest update…a Customer Hub. Initially I wasn’t excited because I thought it was an integration with Infusionsoft’s current subpar Customer Hub offering. I quickly realized that was not the case. 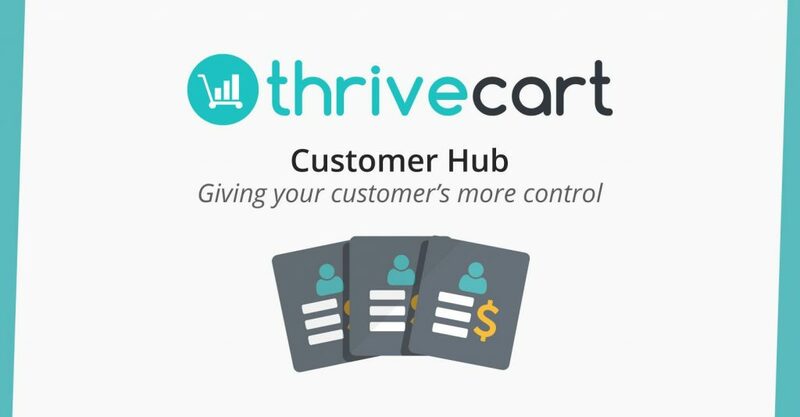 ThriveCart now gives you the ability to allow your customers to manage their information on their own. From changing email addresses to updating credit card information, your customers can do it all themselves. The biggest benefit for me is the updating of cards. Prior to this if someone wanted to update their billing information, I always had to do it. Sometimes, if they needed to update their credit card, I’d have them re-purchase the same product and cancel the previous. This kills your reporting in ThriveCart. Now it looks like those days are long gone. Josh and his team really know how to keep their dedicated group of folks happy. What Did Drip Just Do? For years, literally, I’ve been trying to tell people that Drip is NOT a marketing automation platform. 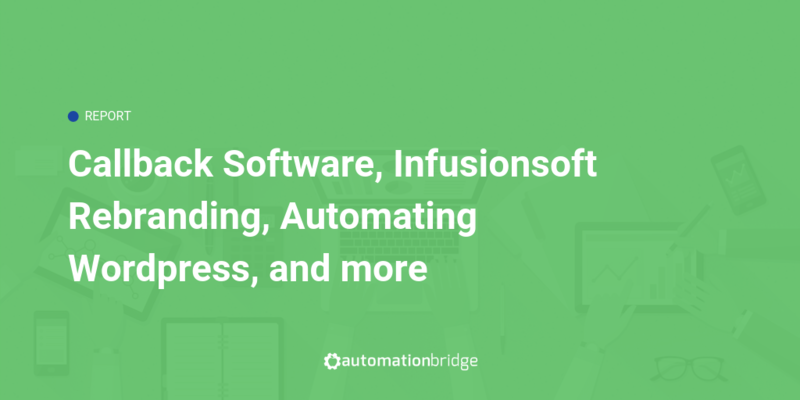 But time and time again comparisons would come up with Drip vs. (name any marketing automation platform). Every time it happens I just shake my head at both the person asking and the type of the answers they receive. 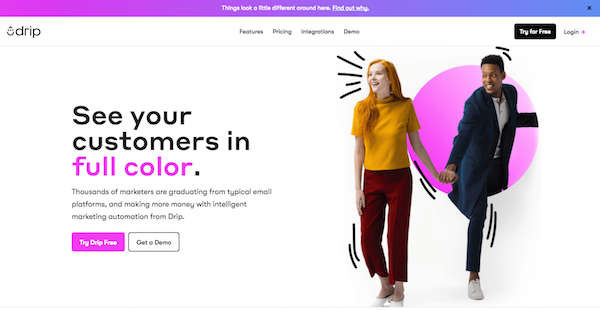 Drip has always been a glorified Mailchimp. 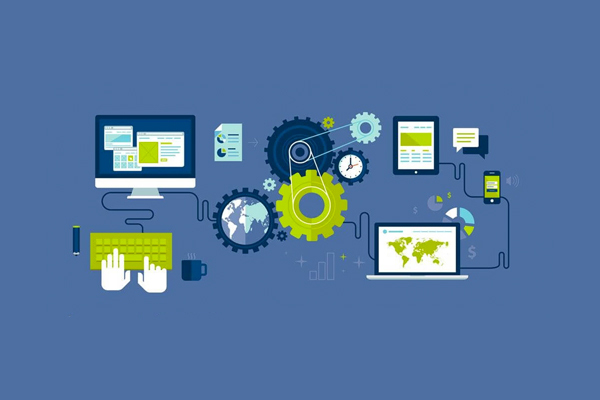 Never focused on full business automation for the small business owner. 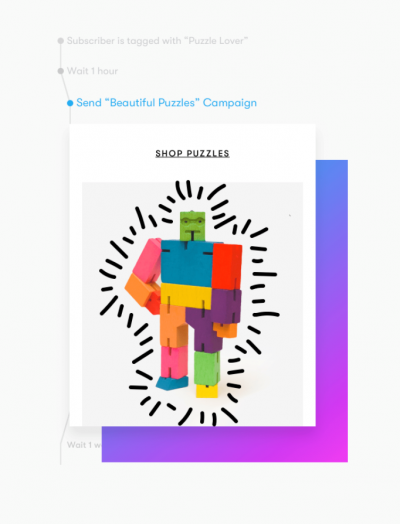 Instead, the tool gives email marketers some additional automation. Which is called email automation, not marketing automation. This is fine if the only messaging you rely on is outbound email. However, most businesses need more. But if you still don’t believe me just take a gander at their newly designed website. What you are about to read is not me bashing Drip. I am simply giving my personal opinion of what I thought and felt with the new redesign as well as point out what they say themselves about their brand positioning. Guess you can already tell what direction I’m going with this huh? Let me start off by saying when my friend text me late at night and told me to go to the Drip website, my initial reaction when I accessed the site was…“uh oh, did the site get hacked?!”. Perhaps one of the worst rebrands for 2018? Everything looked so drastically different I thought it had redirected to some fun teenie bopper website as a cruel hacking joke. But I checked the url and it was nothing of the sort. Only one word can describe my initial thoughts…YUCK. Quite honestly, I hated the design then, and I hate the design even more now. That may sound harsh but I think it’s not supposed to be appealing to me. Reading through the copy it seems like they are targeting a younger audience that just wants to sell stuff online. Not a serious business owner looking to scale their business. I can’t imagine a consultant pulling up this site explaining that this is the tool they recommend and the business owner not taking them as a joke. One friend thought it was a Virginia Slims website update targeting teens. Another one of my friends said it reminded them of the Brady Bunch. Other friends visited the site scrolled a bit and simply couldn’t take it any more and closed the tab. The funniest comment I heard was someone say, “look! They even have a hairy robot!”. Hairy robots are a thing now??? I know Leadpages has gone through some MAJOR changes lately and I have to say I don’t think the Clay Collins I know would ever sign off on such a visual representation. It just doesn’t seem like a Clay decision, especially being that he is one of the most brilliant marketing minds I’ve ever personally met. Speaking of marketing…looks like they are positioning themselves as a CRM for eCommerce owners. They are attempting to coin the term ECRM. The strange thing is they are NOT a CRM. Never have been. In fact, in their own copy they say “traditional CRMs are only for B2B businesses that have a sales team” (they have since then removed that statement…good move). Which displays rudimentary understanding of a CRM at best. But hey, maybe an EckRim (ECRM) is going to be the next big thing for those budding teenagers that want to sell comic books and toys online. Last thing to note is their pricing. When is that last time you saw an enterprise plan start at 5,000 contacts for an email platform? Mailchimp gives you 2,000 for free! If 5,000 contacts makes you enterprise then I guess the majority of small businesses should be classified as conglomerates. The newly updated copy also instructs you to “Don’t go big”. Further proving that they are laser focused on a much smaller market with much smaller ambitions. All in all, I think this is going to help them accomplish what they set out for…more sales from smaller businesses (or aspirational business owners). The rebrand is effectively isolating and turning off who it’s supposed to turn off. And maybe it’s one bold move of a much larger strategy. 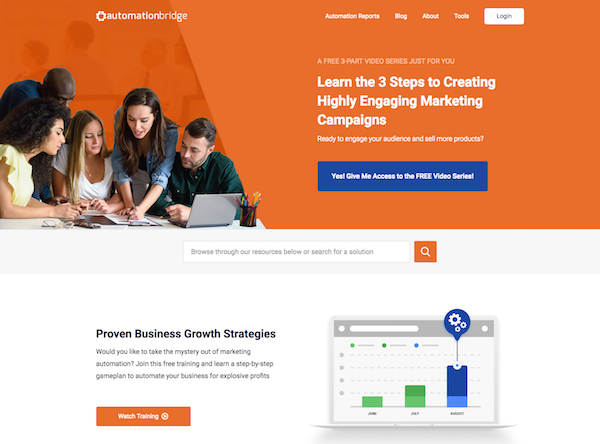 Either way, for those looking for a true marketing automation solution…move along, nothing to see here. Speaking of website redesigns, have you had a chance to browse around this website? If so, you’ll see it’s gone through quite the design overhaul. My intent was to give it a bit more professional and polished look opposed to the traditional blog look and feel. Hopefully I’ve been able to achieve it. With all new website redesigns it’s critical to monitor the use of the site to test all your design assumptions against real world usage. Hotjar is one really good tool for that. You can use it to record browsing sessions to see how people are interacting with your new design. Another tool I’ve been trying is the Big Picture WordPress plugin. It easily creates events (like link clicks) and sends them to Google Analytics (and ActiveCampaign) so you can analyze how your design is performing. The most important part of this redesign is that I did not do it. This was a huge leap for me since I’ve always preferred to control my site. I hate the idea of a developer being able to control more of my site than me. At the same time, I could not afford to keep spending time on it. If I wait on me to refresh the site it will never happen. And you know what…I’m so glad I didn’t. By hiring a designer and developer it forced me to take off my implementor’s hat and put on my management hat. Don’t get me wrong, I had a thorough process of finding a developer that used all the themes and plugins I’m currently using. In fact, I gave them marching orders to not custom code anything and to use the built-in Beaver Builder modules for everything. He did just that and I’m 100% satisfied with the result. Remember, the most valuable thing a business owner can learn how to do is to get things done to their standard without having to do it themselves. As time goes on I’ll be touching less and less of the technical stuff and things will look and function better because if it. I’m retiring my jersey and heading up to the front office for my business. I suggest eventually you do the same. It didn’t take long to make me a believer. Well…actually it did. I remember stumbling across AirTable some years ago. Back then it just seemed like they were in the business of making prettier spreadsheets. I didn’t really get why I needed that. Fast forward to today and that has all changed. Not only do I understand the difference, but I now find myself wanting to put everything into Airtable. Let me back up. AirTable is a database application (similar to Microsoft Access) that makes data entry and display easy (and kind of fun). A good way to explain it is if Trello and Google Sheets had a baby and Asana bought the clothes. The reason why this is important to understand is because there’s probably a great chance you have been relying on Google Sheets for functionality that is better suited for database software. The problem is, such software didn’t exist. For instance, I’m always find myself creating drop downs for my spreadsheets to organize my data. Spreadsheets were never really intended for that. In fact, databases are the perfect tool for organizing. Spreadsheets, on the other hand, are great for calculations. In AirTable rows are records and columns are values determined by the format of the header column. It’s easier to think of the cells in a row similar to values collected from a form. When the form is submitted the record now holds all of those values and displays them horizontally. With that understanding it makes sense to me why Airtable is so appealing and easy to use. Most of my needs revolve around needing to organize my data in a way that’s easy and effective. A good example is a database of email copy for all of your funnels. I recently created a base (that’s what databases are called in AirTable) where each row is the name of the email. I have them organized by sequence in which they go out and which Leadmagnet they’re attached to. I have another base for all of my blog content. It can be easily organized by publish date, categories, and SEO keywords. Lastly, although the default view is rows and columns. You can add multiple views for your bases to display how you prefer. One is Kanban. This is where the comparison to Trello comes into play. Within the Kanban view records display as cards and can be moved by dragging and dropping. There’s also a calendar view if you have due dates displayed on your records. This is great for an editorial calendar or a time sensitive project you’re using AirTable to manage. I could keep going about the benefits of organizing your data easily with AirTable, instead I’d invite you to try it for yourself. Click the link below to setup a free account. I’m using my referral link because every person I refer unlocks more features for me. Make sure you report back and let me know how you like the tool. 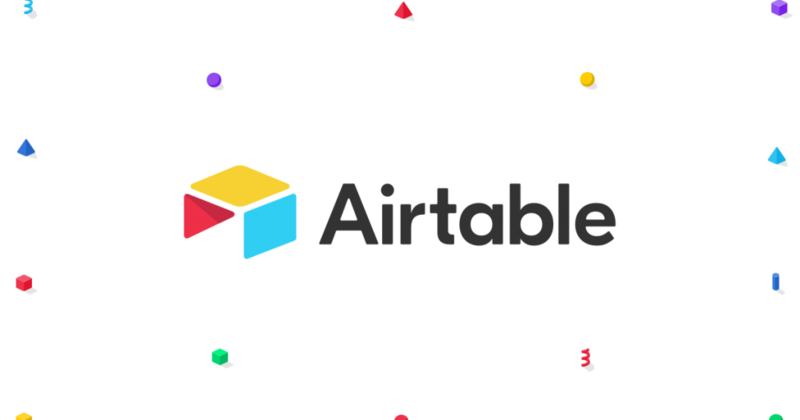 If you’re already using AirTable, I’d love to hear your take on it in the comments below. How Is Your Business Documentation? Documentation for businesses is one of those “boring” areas of business. I haven’t worked for or with a company that did this well initially. However, Standard Operating Procedures (SOPs) are your lifeline to not being tied to working in your business. Having your process well documented positions you to be able to shorten the learning curve involved in bringing on new staff. It adds a layer of stability to your business by empowering others to run it effectively. When I was actively consulting it was one of consistent trends I saw with businesses built for success. Unfortunately, most business owners are moving so fast in so many different directions they don’t take the time to ensure their processes are well documented. I don’t blame them since they really shouldn’t be the ones doing it. Their VA or marketing consultant should. The good thing is that there are tools that make the documentation process a lot easier these days. The tool I’ve used for years is called Clarify-It. It allows you to start a document and take screenshots that are automatically entered into the document in the appropriate place. This allows you to establish an uninterrupted workflow of typing and embedding pictures. When you’re finished creating the document you can export it as a pdf or to the G-Suite for easy sharing for collaboration. Unfortunately the tool is being discontinued and they are putting all of their focus into their SaaS product ScreenSteps which is heavily focused on employee on-boarding and training. The reason why you would want this type of software in the cloud is because it allows a more seamless experience for new employees learning a process or going through training. You can update the documentation and it’s immediately updated for everybody. You can also track engagement. Imagine having a podcast SOP that must be followed for each episode. Using cloud based documentation software you can ensure every episode goes through the same process and even keep track of who completed it. Hope you enjoyed this issue and as always leave a comment below and let me know what agree or disagree with!